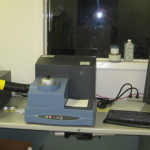 TA Q20 DSC measures thermal properties of polymers/coatings. such as glass transition temperature, melting point, crystallization temperature, degree of cure, oxidation induction time. Instron Testing Machine, Model # 3369 is a widely used mechanical testing machine to measure material tensile, compression, shear and flexure properties, such as strength, modulus, strain. It is controlled by Bluehill software and also equipped with accessories to measure Poisson ratio, peel strength coefficient of friction and flexural properties. 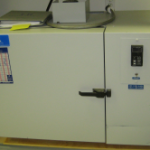 A temperature chamber is also equipped to measure material properties at elevated temperatures. Fixed Radii Mandrel Bending Machine measures the flexibility of coatings applied on metal substrates. 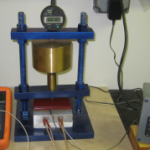 It gives very repeatable flexural strain measurements. 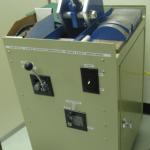 The Penetration Resistance tester (ASTM G17) measures the penetration resistance of buried pipeline coatings from rocks under soil pressure. 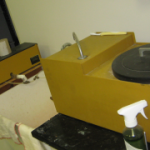 A hot plate is used to heat coatings. 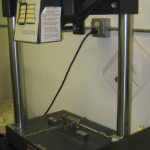 Drop Weight Impact Tester, ASTM G14, measures impact strength of polymers/coatings. 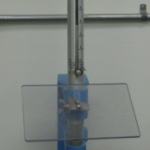 PosiTest® Pull-Off Adhesion Tester, ASTM D4541, measures tensile pull-off adhesion strength of coatings on metal substrates. 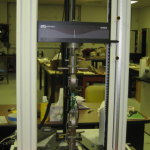 Pendulum Impact Tester, ASTM D256, measures the impact strength of notched polymers (Izod pendulum impact test). QFog Salt Fog (Salt Spray) test Chamber(ASTM B117, D5894, G85) examines the corrosion resistance of protective coatings. 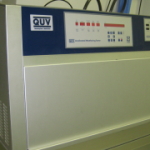 QUV Chamber (ASTM G154, D5894) examines the UV resistance of polymers/coatings. It can also cycle UV(shine) and water condensation (dark) to simulate atmospheric exposure. 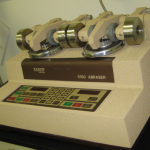 Cathodic Disbondment tester (ASTM G8, G42, G95, D6676) measures coatings’ resistance to disbonding, imposed by cathodic protection current. 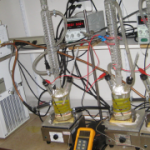 High temperature testing capabilities are also equipped to test cathodic disbondment at high temperatures. 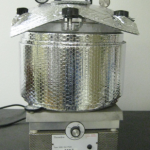 Boiling Water Test measures water absorption of coating samples at the water boiling temperature. 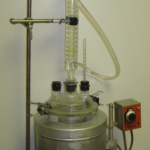 Water Bath is used to measure water absorption of polymers and coatings at temperature below boiling point. 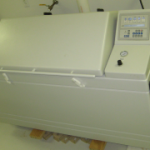 Autoclave test is to evaluate water immersion resistance at a temperature above boiling point. It is a good screening tool to evaluate coating performance in hot water. 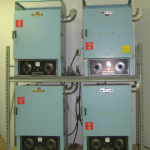 Constant Temperature Ovens are used to conduct long term thermo-oxidative aging of polymers/coatings. 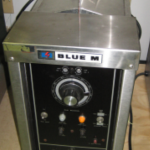 Thermal Cycling Oven is capable to cycle the temperature in the range of 200 °C to -40 °C. Grinding/Polishing Wheels are used to prepare samples for microstructure examination. It is a powerful tool for failure analysis. 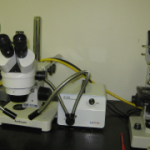 Optical Microscopes are used to examine coating material microstructure for failure analysis. 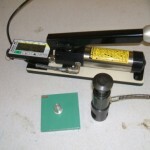 Mitutoyo SJ-201 Surface Roughness Tester, measures the surface profile. Surface roughness parameters, such as Rz, Ry, Sm, Peak count, Pc can be displayed.